According to standard models supernovae produce radioactive 44Ti, which should be visible in gamma-rays following decay to 44Ca for a few centuries. 44Ti production is believed to be the source of cosmic 44Ca, whose abundance is well established. Yet, gamma-ray telescopes have not seen the expected young remnants of core collapse events. The 44Ti mean life of 89 y and the Galactic supernova rate of 3/100 y imply several detectable 44Ti gamma-ray sources, but only one is clearly seen, the 340-year-old Cas A SNR. Furthermore, supernovae which produce much 44Ti are expected to occur primarily in the inner part of the Galaxy, where young massive stars are most abundant. Because the Galaxy is transparent to gamma-rays, this should be the dominant location of expected gamma-ray sources. Yet the Cas A SNR as the only one source is located far from the inner Galaxy (at longitude 112°). We evaluate the surprising absence of detectable supernovae from the past three centuries. We discuss whether our understanding of SN explosions, their 44Ti yields, their spatial distributions, and statistical arguments can be stretched so that this apparent disagreement may be accommodated within reasonable expectations, or if we have to revise some or all of the above aspects to bring expectations in agreement with the observations. 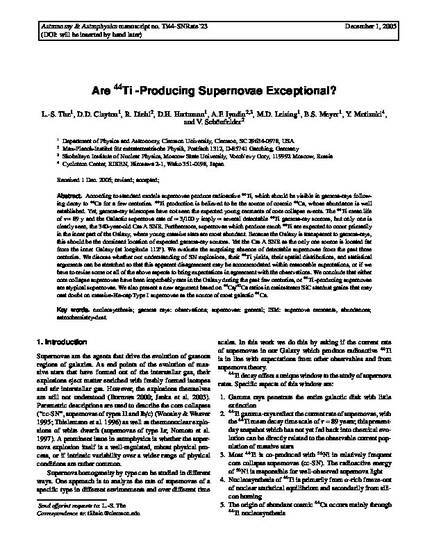 We conclude that either core collapse supernovae have been improbably rare in the Galaxy during the past few centuries, or 44Ti-producing supernovae are atypical supernovae. We also present a new argument based on 44Ca/40Ca ratios in mainstream SiC stardust grains that may cast doubt on massive-He-cap type I supernovae as the source of most galactic 44Ca.